Collect other Barbie dolls and accessories to play out experiences around the world because you can be anything with Barbie! 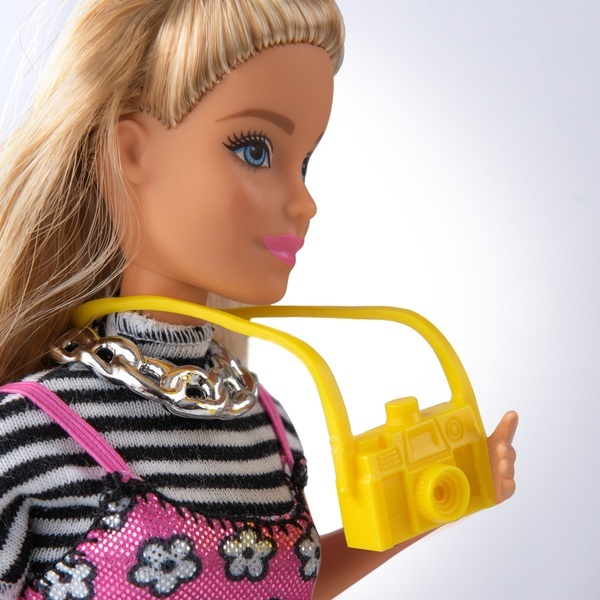 Take Barbie doll anywhere because her suitcase is packed, her pink passport is current and she's ready to go! Young travel lovers can take their dreams around the world with this travel set. Barbie doll has a "rolling" carry-on -- it's decorated with stickers and really opens to pack in the fun! She's also equipped with a camera, headphones and smartphone. Her outfit is travel flexible: a black and white striped top under a shimmery pink dress with cute floral print. Go from plane to party with a switch of her shoes -- she comes with white booties and blue heels. Sunglasses and a silvery necklace add glam when she needs it. And a cut-out bag is stylish and can hold her passport! Where to next? Let young minds take off and explore the whole world because you can be anything with Barbie! Doll cannot stand alone. Colours and decorations may vary.